Monumental Sports and Entertainment Foundation hosted its annual Pick-A-Stick on Tuesday when the Caps hosted the Detroit Red Wings. Player autographed sticks were sold at the MSE Foundation table behind section 104, starting when doors opened at 6:30 p.m. Each stick was autographed by a Caps player; that is, almost every stick. Some very lucky fans purchased a stick that was not autographed and they had the pleasure of meeting Caps right wing T.J. Oshie. He signed their sticks personally after the game. Always a very popular and profitable fundraiser, fans flocked to the MSE Foundation table to purchase sticks. Each fan was limited to two sticks, which sold for $75 apiece. The Pick-a-Stick program benefits The Monumental Sports and Entertainment Foundation supports the charitable efforts of the Capitals (Caps Care), Mystics and Wizards throughout the Washington metropolitan area. This annual campaign is one of the many Caps Care programs. Last year, Pick-a-Stick raised over $18,000. A similar MSE Foundation campaign, Fall Puck Surprise, recently raised $18,000 to support the foundation. This year’s Pick-A-Stick proved to be equally successful raising over $18,000 once again. Oshie was all smiles as he greeted the Pick-A-Stick winners. He has just netted a shootout goal to help the Caps beat the Red Wings 3-2. 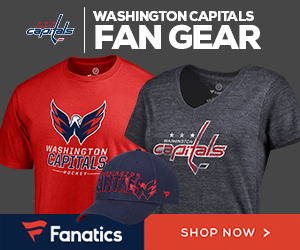 The Washington Capitals organization is dedicated to supporting local charities and nonprofit organizations through the donation of Caps memorabilia. Ted Leonsis is the founder, chairman, majority owner and CEO of Monumental Sports and Entertainment.